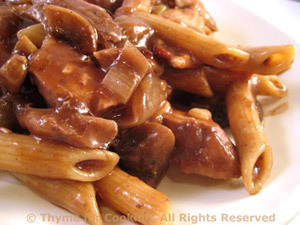 Coq au Vin Pasta, using leftovers, Thyme for Cooking. This is an easy use of leftovers: just cut, combine and heat! Cook pasta according to package directions, Drain. Heat oil in nonstick skillet. Add shallots and sauté until tender, about 10 minutes. Cut the leftover coq au vin into small, bite-size pieces and add to skillet. Add 1 1/2 cups of sauce to skillet and heat through. When pasta is done, drain and toss with chicken and sauce. Add more sauce if needed and heat through. Serve. Note: if you don't have enough sauce add a bit of chicken stock and 1 - 2 tbs tomato paste to skillet.